Halloween is celebrated on October 31st in the United States. Halloween is a favorite family celebration – a time for traditions such as dressing in costumes, trick-or-treating around the neighborhood, and carving pumpkins. American children dress up in funny or scary costumes and go "trick or treating". The neighbors are expected to respond by giving them small treats. Adults may also dress in costume for Halloween parties. The name "Halloween" comes from the Christian tradition. It is derived from "All Hallow's Eve." October 31st is the eve of All Hallows day, better known as All Saints Day. This is a day when the church celebrates and remembers the lives of the saints. Halloween is a secular celebration based on ancient Druid customs, dating back to 700 B.C. The Druids, a Celtic religious order in ancient Britain, Ireland and France, believed that the souls of the dead returned to mingle with the living on "hallowed eve," October 31. Each year on that night, the Druids would build bonfires and offer sacrifices of crops and animals, and individuals would dress in costumes to disguise themselves from these spirits. Halloween first was celebrated in the United States in the 1840s, when Irish Catholics, fleeing from the potato famine, brought Halloween customs with them to America. The tradition of carving jack-o'-lanterns originated with Irish children who first carved out the centers of rutabagas, turnips and potatoes and placed candles inside. This symbolized a mythical ghost doomed to walk the earth forever because he had angered both God and the devil. 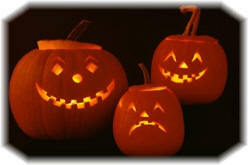 The new Americans found that pumpkins made even better jack-o'-lanterns than the other items they had used in Ireland. Halloween Safety (The National Safety Council) - Parents can help prevent children from getting injured at Halloween by following these safety tips from the National Safety Council.